A Rugby personal trainer who injured a police officer by driving off when stopped to be arrested for harassment was spared jail yesterday (Wednesday, May 10). Triston Dickens escaped arrest in January last year by lying about his identity, leading officers to his car and speeding off, hurting one of the cops who tried to take the keys out of the ignition. 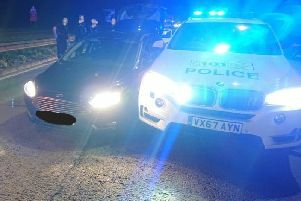 The 29-year-old, of Butlin Road, pleaded guilty at Warwick Crown Court and was given a 10 month suspended jail sentence, despite two previous convictions for dangerous driving. Sentencing Dickens, Recorder Alastair Smith he acted obstructively from the offset. Naomi Nelson-Cofie, prosecuting, said that in January, 2016, PC Shaun Haywood and a colleague went to an address in Bucks Hill, Nuneaton, to arrest Dickens on an unrelated matter. While the uniformed officers were outside in an unmarked vehicle, they saw a car pull up and Dickens got out and went into the address, and they following him inside. When they questioned him, Dickens gave his brother’s name and claimed he had identification in the car, so they accompanied him back to the car to get it. But as soon as he got in, Dickens put the key in the ignition and started the car. PC Haywood reached in through the open door in an attempt to remove the key, but Dickens drove off, and the door pillar hit the officer’s arm, causing reddening and bruising. As Dickens sped away without looking, PC Haywood heard other vehicles skidding as drivers had to brake hard to avoid a collision, said Miss Nelson-Cofie. She added Dickens, who handed himself in a few days later, had previous convictions for drug offences and violence, and in 2010, and 2013, for dangerous driving. He had subsequently been given a suspended sentence for harassment – and a month after the incident he passed an extended driving test to get his licence back after an earlier ban. Patrick Maggs, defending, conceded: “He understands the jeopardy he is in today, if only by reason of the previous convictions, and he’s brought a bag with him into the dock. Mr Maggs argued the offence came ‘at the lowest end of dangerous driving,’ and a prison term would be likely to be too short to allow the sort of rehabilitation a suspended sentence could provide. He said a few weeks earlier Dickens had been given a formal warning by the police about ‘a credible threat to his life’ – and had been alarmed when two ‘partially-uniformed individuals’ walked straight in and began asking who he was. “He had perceived a threat where one was not present,” commented Mr Maggs, but Miss Nelson-Cofie responded by pointing out the officers say they were in full uniform. Dickens pleaded guilty to dangerous driving, common assault, driving while disqualified and having no insurance. He was sentenced to 10 months in prison suspended for two years, ordered to do 120 hours of unpaid work and given a 10pm to 6am curfew for three months. Recorder Smith also banned Dickens from driving from two years and ordered him to pay £200 compensation to PC Haywood and £500 costs. “You have been given many chances, and you have wasted most of them. Don’t waste this one,” Recorder Smith added.